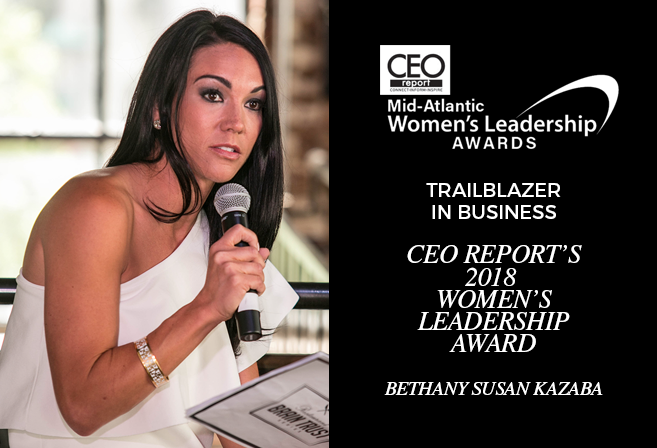 CEO Report is pleased to announce the 2018 Mid-Atlantic Women’s Leadership Award winners. The Women’s Leadership Awards program honors CEOs and Executives who are moving their companies and communities forward. They are being recognized not only for their professional accomplishments, but also for their contributions within their community. The women selected are trailblazers in business and truly stand out for being passionate about philanthropy and inspiring up and coming leaders. “This year’s Mid-Atlantic Women’s Leadership Awards winners have made outstanding impact, both professionally and philanthropically. The 50 women selected have built successful businesses, grown their companies and organizations, and dedicated their time and energy to improving their community and causes important to them. We’re honored to recognize them and their accomplishments,” says James McDonald, President and CEO of CEO Report.